The Auction Room will hold their second auction of Middle Eastern Contemporary Art on 1st October, following the success of last year's auction which had a realised total of £235,348. Hayv Kahraman's diptych Carrying on Shoulders 1 & 2 had a pre-sale estimate of £36,000 - £40,000. Following intense international online bidding it reached £57,100. 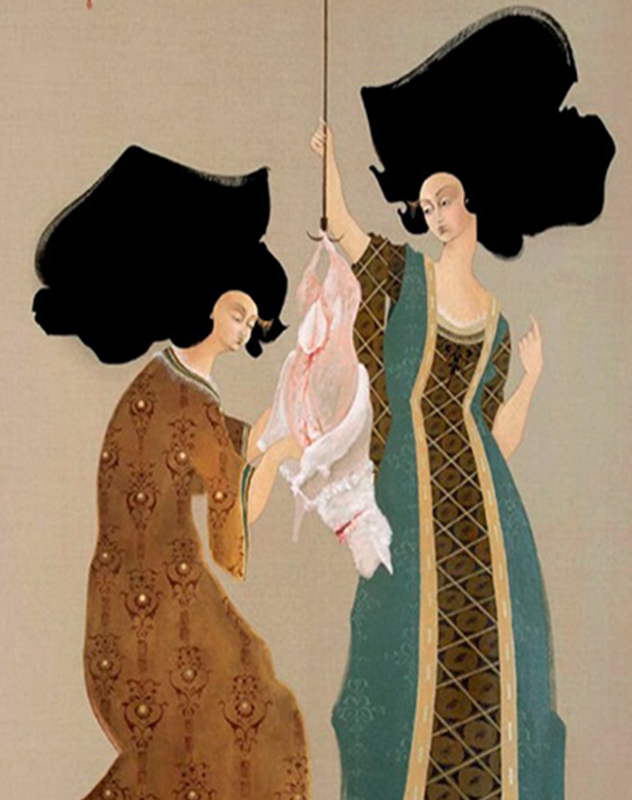 October's sale will see another piece by Kahraman entitled Slaying the Lamb which has an estimate of £30,000 - £50,000. Other well-known artists as well as new stars of Arab and Iranian art will be up for offer including: Ramin and Rokni Haerizadeh, Jeffar Khaldi, Abbas Kiarostami, Youssef Nabil, Khosrow Hassanzadeh and Laila Pazooki. The works included will be from two impressive private collections and the Unveiled: New Art from The Middle East exhibition which was seen at the Saatchi Gallery in 2009. The Auction Room's Janet Rady said of the sale: "We are very excited to be holding our second Middle Eastern Contemporary Art auction online, with the unique element of a physical preview exhibition in London. Overall confidence in the market remains high both in the Middle East and internationally as we see major exhibitions being mounted in this category, such as the current exhibition at the New Museum in New York of art from and about the Arab world. It's exciting to see new artists emerging, such as Gohar Dashti, Laila Pazooki and Mostafa Darehbaghi and for more established ones consolidating their position worldwide. With estimates ranging from £1,000 to £50,000, the auction provides the perfect opportunity for a variety of collectors from all parts of the world to participate. " The works address the political and social issues of the artists' native homes, which in several cases, has led to exile or arrest. At the same time they also take influence from and convey pride in their county's artistic heritage and legacy of decorative arts. Check out more from The Auction Room here.